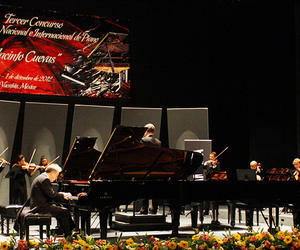 Cuban Antonio Martín García and Mexican Aaron Martínez Hernandez were winners of the fourth annual International Piano Competition José Jacinto Cuevas held in the Mexican city of Merida in Yucatan State. The event brought together 40 participants from Cuba, Colombia, Guatemala and Mexico. Martin Garcia and Martinez Hernandez received the awards in the category of Elders and Youth, respectively. The Cuban artist chose the Piano Concerto No.1, S.124 by Franz Liszt, a work in four movements premiered in 1855 by the composer as soloist himself, under the direction of Hector Berlioz. In result of this distinction Martín García won a cash prize, a grand piano Yamaha GC1M-PE, as well as the possibility of offering a concert at the headquarters of the Autonomous University of Mexico (UNAM) and one with the Symphonic Orchestra of Yucatan in Merida in addition to recording a phonogram. The second and third in the Senior category corresponded to Cuban Victor Diaz Hurtado, and the Guatemalan Héctor Hernández Villatoro, while the fourth fell to Cuban Fidel Leal Camacho. In the Youth section Mexican Diego Mallén Mendoza and Francisco García Torres picked up the second and third respectively. The contest José Jacinto Cuevas is held since 2008 with the aim of supporting arts education in a space conducive to healthy competition among the performers.